If spotted call 202-664-2301. Do not chase! Take cell phone pic, if possible. See our FAQ for more about what to do, and how we confirm sightings. Confirmed Sighting: May 9 2012, north Chevy Chase. December 11, neighborhood outside Colombia Country Club. October 20, Colombia Country Club. September 14, Candy Cane City and into Rock Creek Park. September 7 or 8, Brookville and Shepherd in Chevy Chase, and then back south on Connecticut to Chevy Chase circle (where she is getting water, we believe). August 28th, on Thornapple in Chevy Chase, and then headed south on Connecticut! A caller, Alan, just told us he thought he saw Sassafras running into the woods off of Campbell Drive / Hill St. near the LDS Temple. This is farther north than we've had a sighting before, but still in the easy reach of the park system that joins to Rock Creek Park. Unfortunately, not a specific enough sighting for us to call the tracker, but we ask that if you live near there, you post to neighborhood listservs and help us get the word out! Folks might ask why we haven't rushed to this neighborhood ourselves. Unfortunately, this is one of those really tough phone calls where the person who called us only saw a dog zoom by. He did not see a harness, and the dog he saw was too fast to tell if there was a collar. Therefore, too fast to answer some of the other things we might ask. A volunteer has been posting flyers in that area. Every time we post flyers in a new area, we end up with new calls (sometimes about dogs that aren't even beagles). Again, without a more detailed sighting, we have very little on which to judge how likely this was Sassafras. If it was Sass, and she was running, she's probably no where near the sighting spot. We know she doesn't stick around in neighborhoods, but moves on quickly. She does, however, return places, which is why we rely on people in the neighborhood to keep an eye out... A more detailed spotting makes it much easier to know whether to send the tracking dog and go ourselves. I have been following Sassafrass's story on Facebook, in addition to the stories of many other lost dogs across the country. I continue most days, to search for any online information; sightings, tips, lost and found pages, in regards to missing dogs due to the devastating tornado that fell upon Joplin Missouri tornado this past May. There were a few who were spotted alive several days after the tornado but yet have not been located. I also continue to search for any information I can on other missing pets as well, including your Sassafrass. You have done an excellent job in your means and methods to find your baby. I applaud you for the use of search dogs and for this website, with current updates and I commend you for doing more! One thing I would like to point out, as I have witnessed on many other missing pet pages on Facebook, people continue to assume that because a dog was last seen with a certain harness or collar; color for instance, or even a leash....that this IS or ISN'T the dog that is missing when spotted. If anyone can get their hands on a missing dog or cat, they can easily change a collar for whatever reasons, or even remove it. If the said pet should flee, the pet will be without any collar, leash or harness. I have also been noticing, and this seems to be epidemic, that there are those who say, "Spot or Fluffy" won't come when their name is called when they are spotted, or rescued. I have had several dogs and I can tell you with 100% certainty, that none of them would have come when their names were called by strangers, be it from a short distance, in a room for example, or out in the open. I shudder to think how many missing dogs were actually found, but bypassed because the collar wasn't the same color she wore before she was missing. Collars can most definitely be a changing, situational condition. Dogs and cats alike have been known to slip out of their collars. 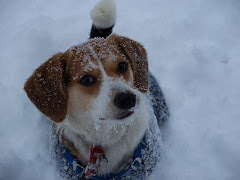 I would like to stress that to all who are helping to locate a missing pet -- do not let the determining factor, to rule in or rule out, be a collar, of any style or color. In closing, please remind those searching not to expect Sassafras to answer to her name whether she is out in the open, or brought into someone's home, a vet clinic or shelter. Nine chances out of ten, she won't give a hoot and will choose to stay quiet! I will continue to follow your quest for her - she will be found, I know she will. Its only a matter of time. She is a beautiful girl and you are good parents to her. Prayers and love from North Dakota. Do NOT give up!! Bre, you have made well informed points and very true. I hope many people read your comment. I believe I read that Sassafras did not have her harness anymore. I hope there are good Samaritans out there willing to put up the traps, etc...to catch this lovely dog. Life is just not the same without your loving pet at home and especially knowing she is out there still alive, there is hope. My thoughts and hope for finding your Sassafras are always with you. It will be the best day ever when she is back home! One of Sassy's favorite things to do is play in the water! Washington Post - Sept 5 - front page! August 16 - Found dog at Wild Bird Center (Bethesda) - was a yorkie. July 26 - By Landon School - turned out to me neutered male Jack Russell. 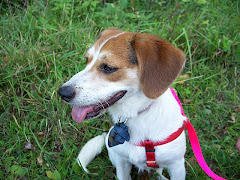 July 20 - By Calvert and Rock Creek Park - dog had a green leash and no brown markings, so likely not Sass. CONFIRMED - July 7th at River Rd & Western! 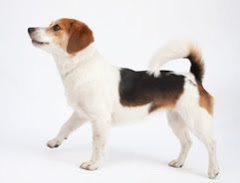 Sassafras seems to be traveling through Chevy Chase down to American U.
June 20 - By Pierce Mill in Rock Creek Park - caller said he saw a beagle by the bathrooms here. Tracker did not find scent. June 15 - 4th & Rhode Island - caller said he saw our dog being walked by a young Caucasian man over the weekend. 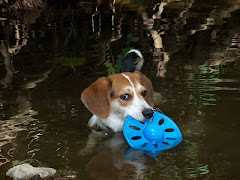 June 12 - Rock Creek Park - Parkside and Beach - sounds like another beagle, was wearing red harness. June 11 - Flower/Carroll area in Takoma Park - unlikely. June 5 - "Florida Ave Park" with a woman who sells dogs. See post below. May 25 - Cecil Co. dog is not Sassafras. 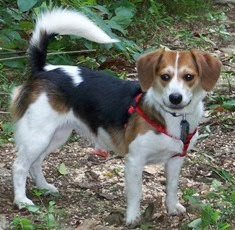 May 25 - Beagle in Laurel MD - see comments on ABC7 news website. UPDATE: not Sassafras. May 24 - Chevy Chase - see blog below. May 22 - Florida and First St, 9:30 PM Report that a homeless man has dog that looks like Sassafras. See related blog post. May 21 - 700 block of Kenyon NE. Caller said they saw a beagle wondering around while driving by in their car. Description of collar did not exactly match Sass', so likely not her. May 20 - 2315 Lincoln Road. Caller claimed a different resident of the apartment building has a dog that looks like Sass (new to them as of a couple weeks). Likely a crank call. debbie9703 said... Is the trap now set?